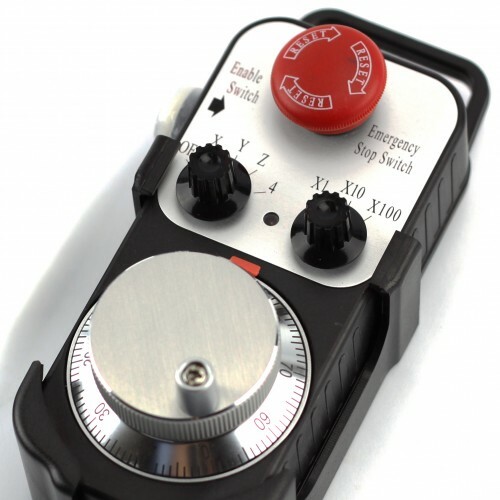 I recently ordered a 4 axis control pendant, and a driver board for this device – hoping to add it to my CNC Router. The package arrived last Friday, and I had a half-hour of free time to try to get it working – no-where near enough time! Automaton Technology C22 Pendant Breakout Board. The pendant is well built, and comes with a nice coiled cable – quite substantial, and a plastic mount for the pendant that can be mounted via the powerful magnets on the back of the holster, or using the supplied screws. There is an “enable” switch on the left side of the unit – I think you have to depress this switch in order for the control functions to work. Unfortunately, this switch is quite difficult to depress due to the clear plastic dust cover over this button. I think I’ll have to remove this protective covering in order to use the pendant. The breakout board comes with a male and female DB25 connector, and some screw terminals for wiring up a 5V power supply, and some relay contacts for the emergency stop button. This is nice since it is much safer to have a real electrical disconnect when the emergency stop button is pressed – you don’t want to rely on the mach3 software properly handling the E Stop input, and shutting down the router. The board comes with a USB cable, with tinned bare cable ends, ready to be wired into the 5V screw connectors on the board. I’m not certain that the 5V input is required in order to make the breakout board function – I’ll check on this when I have more time. My hope was that the USB cable would actually be a sort of USB Keyboard emulator, simply outputting keystrokes to Mach 3, in order to control it. But, this is not the case – the USB cable is for 5V power only. The instructions and diagrams that come with the Pendant and breakout board are woefully inadequate. They explain, from a purely electrical standpoint, the connections – but they really don’t cover how to make it work with the Mach 3 software. There should be an extra page or two of notes showing how it all works together. For instance, exactly how do you configure Mach 3 to use the pendant? No mention that the pendant needs a second parallel port – and that the second parallel port can actually have a whole lot more input pins, via a checkbox in Mach 3. No explanation about how the “OEM Inputs” are made to function in Mach3. No mention about whether the 5V power is needed to make the breakout board function or not. I was testing the board with a third-party dual port parallel port driver board in my PC, and was having nothing but trouble getting the second parallel port to function, and to properly interface with the pendant. I could successfully get the E-Stop button to work, and the X100 button – but no other button seemed to work! I think I may have connected it to Parallel port 1, instead of Parallel port 2. I made some guesses at how the Mach3 settings should be configured to make the pendant work – but it’s all pretty much guess-work at this point. I hope to get back to this during the upcoming week – so I’ll have an update, with screen-shots showing how to make the pendant work. Assuming I’m successful! UPDATE: I FINALLY found a page with a thorough set of instructions. And following the instructions step by step worked. One trick not mentioned is that you need to restart Mach3 between some of the steps. I needed to do this once I had properly enabled the optical encoder. I could see the signals going by in the the diagnostics window, but they didn’t move anything at all on the device. A simple reboot, and the X, Y and Z axis were working under control of the big knob! What fun! This may have been necessary when I enabled the encoder and pins 2 and 3. So, another cool addition to the CNC Router! UPDATE: I got this thing working late one night, then the next day, busted again! I have no idea what’s up, and why this pendant is so fragile. I spent 3 hours, playing with settings, changing parallel ports, measuring voltages, all with no success. I’ve finally given up, and ordered a new C22 board, since it’s about the only thing I haven’t swapped out. Quite frustrated. Have since noticed that there are USB pendants, which are starting to look pretty darn good, right about now. Here we are in June 19 2013. I have also bought the MPG2 and the C22 board from CNC4PC. Having a hell of a time with installing it. Not much help from Arturo. Followed the Guide for setting up MPG2/3/4 over LPT2 using Mach to the letter. I may add, this is the only guide on the web for this purpose. Than, I realized this guide is 4 years old. I have an Ethernet Smooth stepper, connected to C25 bob. All purchased from the above site. The Enable button on the left hand side of the MPG has to be depressed for axis selection. This is not right, I have used MPGs on many industrial machines, and all one had to do was to select the axes that is needed. Can you get back to me, and let me know how you got yours going. I would appreciate it if you would get back to me. Well, I never did end up getting that pendant going reliably. I got it working one evening, and then the next day, it failed again. Half the trouble seemed to be getting the second parallel port to work reliably. Also, the interface board to the pendant seemed flaky. I spent a bunch of time, tried swapping the parallel ports – using the pendant on LPT1, and the Gecko 540 on LPT 2, and even tried a replacement interface board. Also, I discovered that you need to restart Mach3 after configuring some of the settings. What I finally did was get a http://vistacnc.com/ P3A pendant, and it has just worked perfectly. It is a USB pendant, and has a little app that runs inside Mach3 to configure it. You can configure the buttons to do different things, which is nice. The CNC4PC pendant is sitting on a shelf here, unused. I came across this web page by accident . Every once in a while I look for a solution to getting my pendent working . Same one as yours. Same retailer. He was no help. Still on shelf after 4 years. I just gave up. Now looking for a real pendant and will throw this one in the trash and let others know how bad it is. Do the same. Not nice to get ripped off.